In 1968, Joya de Nicaragua became the first branded cigar in Nicaragua, so this year they created something special to honour their 50th anniversary. 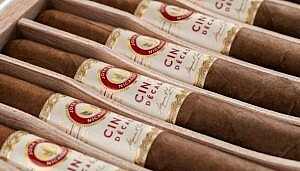 The appropriately-named Cinco Décadas is produced in the company’s two original sizes—7 x 50 El General and 6 x 54 Diadema. These Nicaraguan puros are made with tobaccos that have been aged for over five years, and smoke with the rich earthiness that Nicaraguan tobaccos are known for. “Not only is this a celebration of the brand of Joya de Nicaragua, but it is also a celebration of the cigar industry in Nicaragua," said Joya de Nicaragua’s United States Brand Manager, Daniel Barrios. Produced in a limited edition of 5,000 boxes of ten cigars each.